Changes to the Winton rallycross track layout will add further spice to the opening round of the 2018 RXAUS.com.au Australian RallyCross series this weekend in country Victoria. Continual track improvements will see a jump introduced for the first time to a venue on the RXAus tour when the series visits this Sunday, 18 February, for the series opener. RXAus made their Winton debut last July and after a hugely successful debut at the Victorian circuit will return three times in 2018, including the season opener this weekend, the mid-winter ‘Speedway Days’ event and a brand-new season finale called the RXNationals. “We wanted to include a jump that competitors have the option to use and put it where the crowd could see it,” Winton Raceway Operations Manager Wayne Williams explained. The new section of circuit is the old service road that runs across Winton’s infield, between turns three and four of the permanent road course layout. The jump will remain optional for competitors – with a path around it for those who don’t wish to use it – however will likely prove the quicker option. “We’re looking forward to seeing how the new track goes alongside the existing RX component which has been retained,” he added. 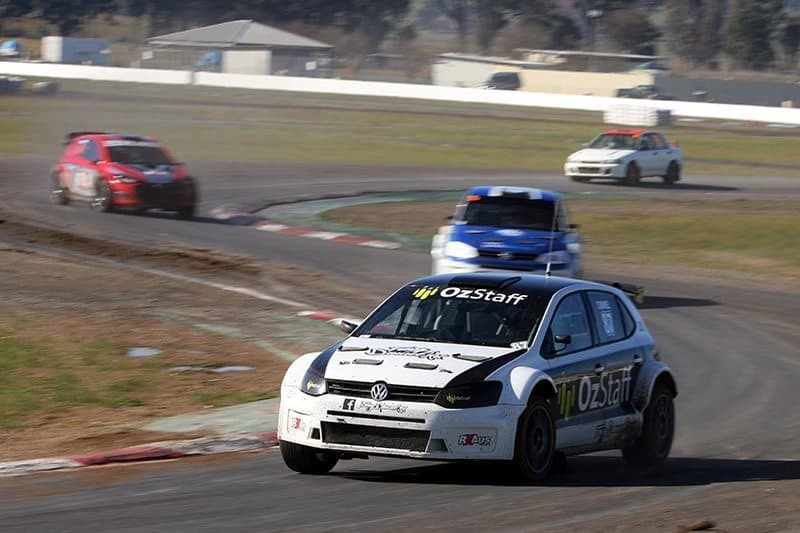 Rallycross returns to Winton on February 18 with the first round of the 2018 Australian RallyCross series. The 2018 RXAus Series is set to feature the most intense competition yet with the All-wheel-drive class in particular set to explode. Defending champion Justin Dowel will return to defend his title in a brand-new Hyundai all-wheel-drive entry. The championship winning car from last year will be taken over by young-gun Arron Windus, who makes the step up after several strong performances in the two-wheel-drive class in 2017. “2018 is a big year for us. We are aiming high and working hard to put the ultimate result together come the end of the year,” Windus said. “This year will see us step up into the 4WD open class driving the Hyundai i20 supercar that Justin Dowel drove to the championship win last year. Everyone at the RXAus workshop have been working flat out to get the car into shape and right up to winning pace, so a huge thanks to them for all there efforts. Meanwhile, TechSport will return with a two-car Mitsubishi Lancer Production AWD class, with 2015 Australian Tarmac Rally Champion Danny Traverso taking over the Evo VIII Steve Glenney raced last year. A brand-new EVO VII built for long-time Production Car racer Kevin Stoopman will also make its debut at Winton. Teenager Troy Dowel, fresh from more overseas competition, will also be a contender in the all-wheel-drive class after several stunning performances last season. After winning several rounds last year, Will Orders will step into two-wheel-drive for the opening round, taking over the well-developed Mazda 2 after delays in completing upgrades to his fire-breathing Mitsubishi Lancer Evolution. AWD Open, Production AWD, 2WD and the Excel Classes all return to RXAus competition this year, with a full entry list to be released closer to the opening round this Sunday.